Roberto Ciccarelli interviews Antonio Casilli on digital labour and platform capitalism while refuting the “end of work”. Originally published in SP’s The Bullet. Roberto Ciccarelli: Antonio Casilli, a professor at Télécom ParisTech, is considered one of the leading experts in the capitalism of digital platforms. He is known for his pioneering research on “digital labour,” refuting the apocalyptic common-sense notion that is proclaiming the end of work as such because of automation. Roberto Ciccarelli (RC): In Italy there has been a lot of discussion about the firing of two IKEA workers, Marica in Corsico and Claudio in Bari. They were fired because their lives could not fit into the algorithm that governs the workforce. Have we gone back to the 19th century? 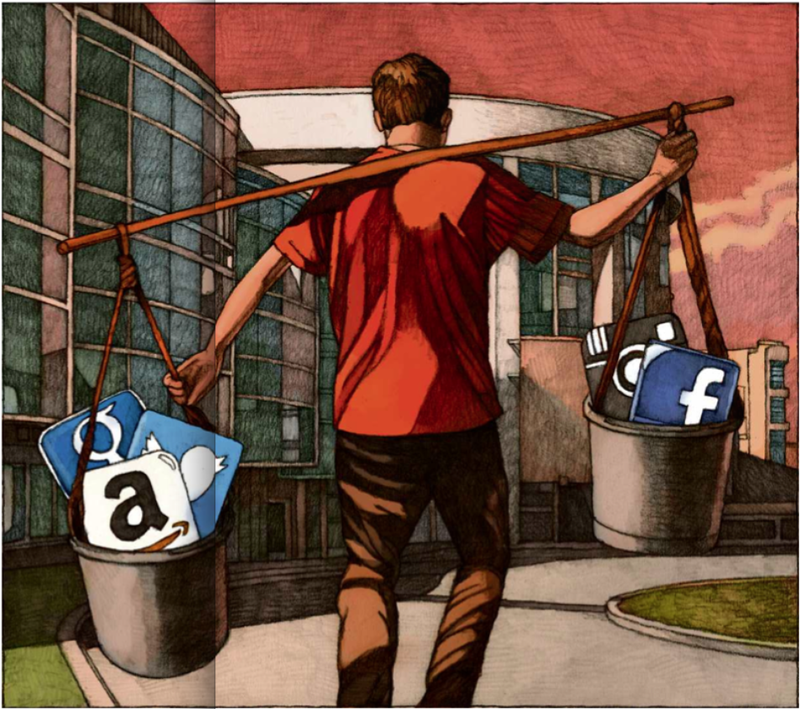 Antonio Casilli (AC): The capitalism of digital platforms makes labour discipline more rigid, as it imposes seemingly “scientific” measurements and evaluations, which can resemble the old industrial manufacturing. The key difference is that the workers, in exchange for their submission to this discipline, are not getting the social safety and the political representation that they obtained before in exchange for their subordination. This new Taylorism has all the disadvantages and none of the old benefits. The workers are caught within a contradiction in terms: subordinate and precarious at the same time. RC: After the Amazon strike in Piacenza, you advised the unions that they should also pay attention to data politics, not only to labour policy. What does that mean? AC: In Piacenza, only the visible tip of the iceberg was seen. That was a strike in a physical location, for better working conditions in connection to tangible assets. There is a whole other part of Amazon that for years has been engaged in struggle. I am thinking of the micro-jobbers on Amazon Mechanical Turk, a system for the creation and training of artificial intelligence that is powered by micro-workers, people paid piecemeal, only a few cents, for data, image and text management tasks. These workers must organize themselves for better compensation and more humane working conditions. In this case, trade unions need to recover lost ground, because the “Turkers” perform tasks that are too small for them to take into account. RC: Are the unions doing this? AC: Yes, although there are several different initiatives at the moment working at the national scale. In Germany, the metalworkers of IgMetall have provided a platform for these workers’ claims: FairCrowdWork. In France, the CGT has created Syndicoop, which helps trade unionists to organize employees around a campaign. In Belgium, there is SMart: a cooperative, not a trade union, which works with freelance workers and also with home delivery workers (“riders”). A process is taking place in which the classical trade unions are seeking to “platformize” themselves, while the cooperatives develop services on a mutual basis for workers on the platforms. RC: From the struggles of Italian “riders,” the demand emerged that they should be put on the same contract as logistics workers. Is it the same in France and in other countries? AC: In the on-demand economy, the services based on real-time platforms and products are the focus of a major legal and political dispute regarding the contractualization of workers. Up to now, the goal has been to regularize their position in a common sector contract that would apply to the area covered by the platform. In the case of Uber, in America, Europe and South Korea labour struggles are converging toward calling for their recognition as urban transport workers. For Amazon, workers are seeking the application of the common contract for postal workers. The action plan still needs to be widened further. AC: By recognizing all the micro-work done by the “click workers,” even those paid a few cents per piece to accomplish tasks such as managing data, images or texts. Their work is useful for machine learning, for teaching a machine how to learn and creating artificial intelligence. RC: And how can this be achieved? AC: Everything is tied to the quantity of information produced, and to how and to what extent the platforms are taking advantage of this production of data. Uber takes between 20 and 40 per cent on each transaction that takes place on its platform, and is fully aware of the value that is being produced. Some of the wealth produced must be redistributed to the workers on the platforms. While this wouldn’t be a wage, such a redistribution would be more equitable than the existing situation. RC: What are other examples of digital micro-work? AC: There are many. It is a global market that counts at least 100 million workers. In China, India, the Philippines and Indonesia, platforms and services exist that are little known in Europe. These workers do a very wide range of jobs that allow Western digital economies to function. In these countries, you can find the Google search engine evaluators (raters). They are the workers who check whether the results of a search are appropriate and correct the range of results by adjusting the algorithm. There are also the content moderators on Facebook or Youtube, who spend their days judging whether particular videos or photos respect the platforms’ terms and conditions. They teach the filtering algorithms what content should be censored. We can also mention the “click workers” who are sharing, “liking,” and promoting advertising or celebrity videos, for which they are paid even less than a cent per click. These people are the real fuel behind viral marketing, which brings the most famous brands to life on the social networks. RC: The on-demand economy is also a reputation economy and an economy of attention, where the figure of the consumer is central. How can workers involve consumers in their claims? AC: First of all, by recognizing that the consumer performs the same type of labour as the Deliveroo delivery person or the micro-task worker on Amazon’s Mechanical Turk. RC: What is the labour that the consumer performs? AC: They produce data as well. This data is used to train artificial intelligence. The consumer produces a critical mass of exchanges and transactions that allow the platform to exist on the market. A consumer is an active and crucial part of the existence of the algorithm. They carry out a large amount of productive actions every day, which are similar to those of digital workers. Even the users on Youtube are doing video moderation for free, by reporting those that are not appropriate. Anyone who uses Google is training the algorithm of the search engine to learn the terms most often sought based on the words entered into it, by us and by others. The consumer is a producer. The boundaries between these economic actors are converging, to the point that we can say that when a platform doesn’t want to pay you, they call you a “consumer,” while, if they are willing to pay you (a little), they call you a task worker or micro-worker. RC: You mentioned “free labour.” What is the role it plays in the digital economy? AC: This “free labour” was already defined by Tiziana Terranova 20 years ago. Even then, being online was labour, because it produced content for websites and for the sites that were called “portals” at the time. Over the past decade, this idea of ​​free labour has changed, as we realized that the platforms aren’t just buying and selling our content — most importantly, they are buying and selling our personal data and personal information: which brands we like, or what time we usually listen to music; or where we are, using GPS. The free labour of the internet user is not creative work, but rather work done without awareness, and much less satisfactory, as it is invisible. As such, it is alienating, to the extent that we do not realize what the data is useful for, and how it will be used, when we solve a “captcha” on Google or add a tag to an image on Instagram. RC: What is this data used for? AC: It is used to produce monetary value for the large platforms that buy and sell information, but it is also used to create value for automation: to train artificial intelligence, teach the chat boxes to communicate with humans, and create virtual assistants like Siri on the iPhone or Alexa on Amazon, who speak to us and help us make choices, or even make them instead of us. RC: So, is digital labour the common characteristic between the struggles of the bicycle messengers on Foodora or Deliveroo, those of Amazon workers and those in the countries of the “click workers”? AC: Yes, these struggles are united by a different form of labour than those we have been accustomed to in the last century. Today, digital labour is done through digital platforms, which must be considered a type of productive organization. In addition, these platforms are both companies and markets. Amazon is a more traditional company with a brutal culture of labour discipline, as one can see, for example, in their warehouses, but also in their offices. But Amazon is also a market, a marketplace based on an enormous catalogue of products and on a less well-known form of commerce: that of data. Deliveroo is the same: It is an enterprise, with employees and tangible and intangible resources, and at the same time it is a labour market that connects customers, productive tasks and delivery workers. In this case, the platform uses an algorithmic type of matching, creating a relationship between different subjects. For Amazon, the relationship is between those who produce an item and those who buy it. RC: You are a supporter of a universal basic income. How would it be able to protect the workforce engaged in digital labour, as intermittent and precarious as it is? Antonio Casilli is a professor at Télécom ParisTech. He has written, among other books, Qu’est-ce que le digital labor? Editions de l’INA in 2015 together with D. Cardon; Stop Mobbing (DeriveApprodi, 2000); and La Fabbrica Libertina (Manifestolibri, 1997). ← Could Sharing Research Data Propel Scientific Discovery?